iA Writer *: A clean and elegant app that is superb for focusing on writing. Its brilliant keyboard extensions make it much faster to move between characters and words while writing. Focus mode helps you concentrate on just a single sentence at a time. It has Dropbox, iCloud and Markdown support and a very nice Mac companion app. Lets you create folders to group your documents in. Byword: Another very clean and minimal writing app interface. Lets you create folders and supports both iCloud and Dropbox for keeping your documents in sync. It also supports Markdown, has dark and light themes, and a beautiful font to work with. Evernote *: An incredibly powerful and feature-rich note taking app that’s available nearly everywhere – on iOS, on the Mac or Windows desktop and in all the leading browsers. Has built-in OCR abilities that will even find search terms within images. Lets you create text, voice, and photo notes, organize them in notebooks, and syncs automatically and flawlessly. The developers have worked hard at providing a cleaner interface for the app, which has always been it’s only weak point. It allows for rich text editing on the iPad with lots of formatting options. Reeder: Excellent Google Reader client for following RSS feeds. Minimal and clean interface and easily the speediest app around at refreshing and keeping feeds up to date. Full support for starring and interacting with feed items. Flipboard *: A flagship iPad app and still the standard for news apps on the iPad. Completely customizable to suit your tastes, great aggregator of all your favorite sources (from Twitter and Facebook to Google Reader), and a gorgeous magazine style layout that makes all the content really pop. It has continued to add great new content and features this year. Instapaper*: The original and still the best app for saving articles for offline reading. Has bookmarklets for one-tap saving for the Safari browser on the iPad and desktop. Provides a great interface and renders articles clutter-free and optimized for the iPad. Has a wealth of strong features and nice little touches to make it ideal for reading. Pocket: Renamed this year, formerly know as Read It Later, and indeed is one of the best apps for that purpose, alongside Instapaper. Has support for video, a very nice UI, and a good Mac companion app. The New Yorker Magazine*: Superb content and a simple, elegant and wonderful UI to read it in. You can buy single issues or take up a reasonably priced monthly or annual subscription plan. One of the rare quality magazines that feels like a lot of effort went into making a real iPad edition. Price: Free app; single issues at $5.99, and subscription plans available. Instacast 3: A far better podcasts client app than Apple’s own app. It’s packed with great features, and it makes everything related to podcasts easy – from finding shows you like to downloading them quickly with zero effort on your part, to letting you know when new episodes are available and presenting tons of useful information while you’re listening to or watching a show. Keynote*: Apple’s whole iWork office suite for the iPad (Pages, Numbers, Keynote) are all very good apps, but Keynote is the star of the suite in my view. It manages to offer a great set of features and make them simple to use with the touch interface. Common actions are carried out with just a few taps and gestures. All you need (and more) for creating and viewing top-notch presentations on the iPad. Imports and exports in Powerpoint compatible file format. This year it has improved its Powerpoint compatibility and added support for master slides. Pages and Numbers*: The other 2/3 of the iWork suite for iPad – Pages for word processing and Numbers for working with spreadsheets. Both are extremely capable apps with a simple UI, desktop companion apps for the Mac, and the ability to import and export in Microsoft Office compatible formats. 1Password for iPad*: Still by far the best password manager app for the iPad, iOS and Mac. Industry standard security, an easy and basic interface, desktop partner apps for Mac and Windows, excellent sync with Dropbox sync as an additional option. It offers an in-app browser so you can login to places like online banking sites securely right within the app. The app also receives frequent, substantial updates and just keeps getting better. OmniFocus*: A hugely powerful and feature-rich task management app for the iPad. There are iPhone and Mac companion apps for it and it offers seamless, automatic and over-the-air (cloud) sync between all three. This sync is better than any I’ve seen in any of the many task management apps for iOS that I’ve tried. The iPad app has a very nice interface so it’s easy to view, add to, and manage all your tasks. One of my favorite things about the app is its superb and customizable Perspectives view. It’s quite pricy, so probably not for everyone – but if you’re a power user of tasks to run your work / life, this app is a godsend. Dolphin Browser for iPad*: An excellent alternative browser for the iPad, with a number of unique and powerful features. These include a webzine for favorite sites, gestures / symbols to access frequently used sites, tabbed browsing, speed dial, full screen mode, and superb sidebars you swipe to invoke for toolbar and bookmarks. Tweetbot: Easily the most beautiful Twitter client for the iPad. Feature rich and an absolute joy to use. It offers multiple timelines, smart gestures, customizable navigation and support for a good number of read it later services. IntoNow *: Yahoo’s app is both a major ‘wow factor’ app and one that makes TV viewing social on the iPad. You tap one big, green button while you’re watching TV and the app will quickly identify the show you are viewing – like Shazam for TV. It’s incredibly accurate in identifying shows and makes it easy to share what you’re watching to Facebook, with or without a comment. You can also connect to friends via Twitter, Gmail and your address book and see what they’re watching. Or just follow the Everyone stream to see what others are watching. It also gives you one tap access to show information from IMDB, iTunes, and Netflix. Facebook *: The iPad app for the world’s most popular social network. It has been buggy and slow at times, but updates in the latter half of this year have improved it significantly. I prefer its interface to using Facebook on a PC. 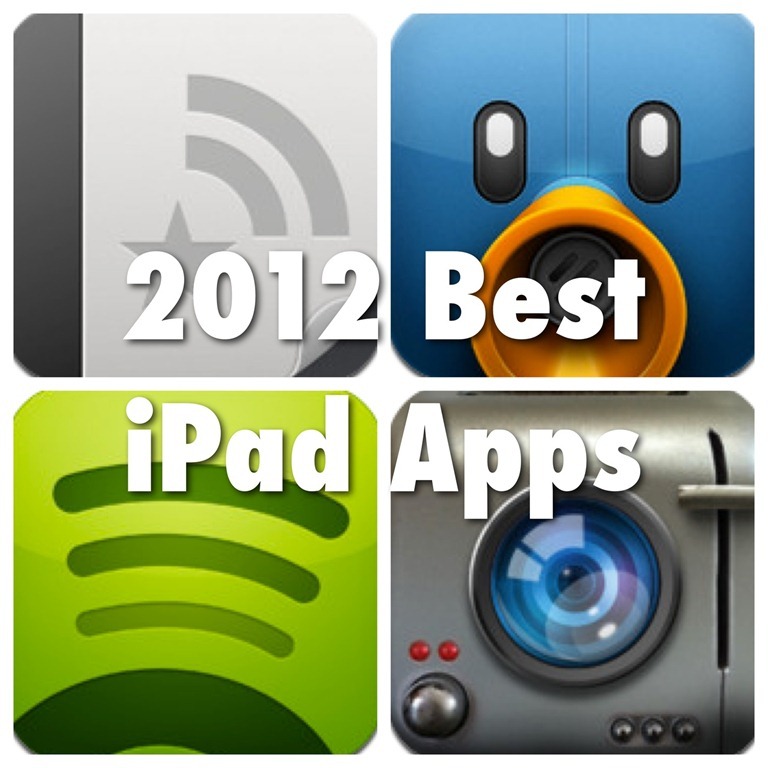 Photo Toaster*: See above for this app’s entry as the best iPad app of the year. 100 Cameras in 1 HD*: Another great photo effects app for the iPad. This one boasts an interface that’s unique, easy to use, and even quite fun to use. It’s the creation of the acclaimed photographer, Trey Ratcliff, and as the name implies it offers a range of 100 gorgeous effects that can be applied to your images with just a couple of taps. You literally just swipe through the effects and choose the ones that you like best. I love that the effects have lighthearted and fun names – for instance ‘Where the thunderdome shook the earth’. Photogene for iPad*: This app is stronger on the editing side of things, but it also offers some nice retouching and enhancing tools. My favorite of its many good features is that it makes it easy to make collages from selected images. This can be done with only a few taps and you get a nice little range of options for how the images are positioned (with more available via In-App purchase). The collage portion of the image used at the top of this post was done in Photogene. FX Photo Studio HD*: An early and constant favorite of mine on the iPad. Has a huge range of over 180 effects, and a very nice, simple UI to work with. The developers issue regular and substantial updates for this app, so it’s continually improving. TitleFx: Another superb app from East Coast Pixels, the creators of PhotoToaster. It shares the same clean and easy to use interface as PhotoToaster. This app makes it simple and fun to create great titles and text blocks for your photos. It was used for the text on the image at the top of this post. Photo Transfer App*: Not an editing or effects app but an incredibly useful app to use when working with photos between iPad, iPhone and PC (Mac or Windows). As the name suggests, it handles transferring images wirelessly – making it easy to move them from iPhone or PC to iPad and from the iPad to iPhone or PC. Weather HD *: This app started out offering very basic, minimal weather information with a gorgeous interface that features video animations to match current conditions. Many other apps have since imitated this concept, but none have done it as well. And now Weather HD has added a good amount of detailed weather information, including 3D weather maps, while keeping the interface simple and great to look at. Band of The Day: Does what it says on the box. Features a new band or artist day every day. It has a superb UI that lets you really get to know each new artist, and catch up on any days that you missed looking at it. It has free full-length songs within the app, lets you easily share your new favorites, and has a great Mix Tape feature that showcases 100 of the app’s top-rated songs. Video Time Machine*: A spectacular curated collection of great videos ranging back all the way to the 19th century. Filled with so much excellent content (over 10,000 videos and growing) that it is very easy to spend hours upon hours in the app, and enjoy all of them. Videos cover a wide range of categories, from sports to TV commercials, from news to games and music. You can browse through categories, let it serve up random videos, or use a simple spinner control to dial up the year you’d like and see all videos from that year or filter by category. Has AirPlay support so you can see all its content on a big screen TV if you’ve got Apple TV. Squrl*: Squrl is the best app I’ve seen for video discovery, and a great app for viewing all the best video content from a broad range of the best current sources. The app makes it easy to add videos to your queue, organize them in channels and make your own playlists. It’s got a web browser bookmarklet for adding videos to your queue as you spot them. It’s also a very social app, that lets you see what’s trending and what videos your Facebook and Twitter friends are watching if you connect those services. 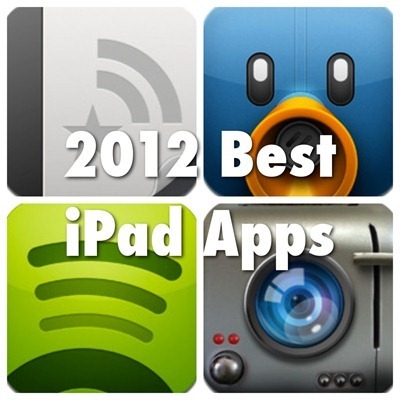 Vodio: Another great app for discovering and enjoying videos on the iPad. Gorgeous magazine style interface presents you with a series of Channels covering popular video categories. Like Squrl, it makes it easy to share favorites and keeps track of what’s being shared most to help surface new content. Fandango Movies*: This one has been the best movies app for iOS ever since it hit the App Store and the iPad version is superb. It’s got all the info you need to help choose a good movie to go see in the theater. You can browse for movies, see trailers and reviews, interviews and more, check showtimes, and even book your tickets within the app. Spotify: The excellent music streaming service now has an iPad app, and it’s a great one. Lets you listen to your own music for free or get full access with a Spotify premium account. US users can listen to free radio as well. Price: Free app, Spotify premium account is around $10 per month. Groovebug*: A lovely mixture of music magazine featuring your own music collection and music discovery engine for the iPad. It scans your music library and compiles pages for for all your artists which feature their songs, videos, related artists and more. All in a beautiful interface that almost feels like a whole bunch of very nice album box sets bonded together. A great way to enjoy your own music more on the iPad and discover new music. TED*: The amazing TED Talks on iPad. TED Talks are ‘Riveting talks by remarkable people, free to the world.’ This app puts over 700 of them on your iPad, with more being added every week. A go-to app for whenever you want your brain to get some real stimulation. Posts: Wow how things have changed in a couple of years. We’ve gone from having zero good iPad blogging apps to now seeing several that are very capable. Posts is the very best of the bunch though, as long as you blog via WordPress or Blogger. It has by far the friendliest and easiest to use interface and supports multiple sites, working offline, and comments management. It handles formatting and images beautifully and is lightning fast. Blogsy: This was the first really good blogging app for the iPad, and it’s still a stellar app. It lets you edit in a rich text sort of mode or in HTML, allows you to bring media in from a good number of sources, and offers support for more than 10 platforms. The developers are continually improving the app and adding features via frequent updates. Battle of the Bulge: A superb turn-based military strategy game designed specifically for the iPad. It’s published by Shenandoah Studio, who are a collection of Hall of Fame level board game designers and other talented folks dedicated to bringing a top quality war gaming experience to the iPad. This I their first title and it is a great start. The game feels a lot like an old school board game. It has excellent and challenging gameplay against its own excellent AI, via pass and play, or online via Game Center. An instant classic. Real Racing 2 HD*: Still the best of a very good bunch of racing games for the iPad. Notable features include 30 cars and 15 locations, a good range of game modes, superb graphics including 3D visuals, excellent controls, and local and online multiplayer game options. And this was the first iPad game to be optimized for AirPlay Mirroring and playing on a big TV screen. Civil War: 1863: Not as strategic as Battle of the Bulge, but a very fun game with very nice graphics. It lets you play as The Union or the Confederates in a good number of scenarios making up some of the critical battles of the Civil War. Flick Golf Extreme HD*: Offers up extreme golf on the iPad – extreme courses, extreme challenges, and extreme fun. It’s original, unique, highly challenging, and very addictive. It’s easy to pick up and play for short spells or to spend a long stretch with. Trivia by Sporcle*: Easily the best trivia app for iOS, or anywhere else, that I’ve ever seen, with a unique approach. Much more challenging than most because it is never multiple choice – it always forces you to know the answers. Each Sporcle quiz is a list for you to fill in – and the range and variety of lists is awesome. Sports is my favorite category and the timed lists include members of the 500 homerun club, name every Wimbledon winner, name every Premier League football club (ever), name every NFL MVP, and tons more. The game is updated daily with fresh new quizzes, and is a great time killer. Word Ladder: Brilliant, hugely addictive word game. A word ladder is solved by altering just one letter in a chain of clues. The puzzles come with a huge variety of topics, are updated every day, and always challenging. Album Art: Create wallpapers with your favorite album covers from your iTunes library – big fun! Great concept and very nicely executed in this app. Has templates that you can customize and retina support. Pimp Your Screen*: By far and away the best app for iPad wallpapers. Has tons of great images of all types, many of them wildly creative. Offers high resolution iPad images (including retina quality), icon skins, app shelves, lock screen and home screen makers, easy previews, and lots more. Content is updated very often – so there are always fun new wallpapers to browse through. London: A City Through Time: A magnificent blend of coffee table book and guide to one of the world’s great cities. The app’s content is nearly as rich and varied as the city itself – covering centuries of London history and culture. Just the images of London through the ages contained in the app are spectacular in their own right. This app is great for those who want to discover the city or those who just want to enjoy its fascinating history. Ascent: Commemorating Shuttle by NASA*: A spectacular movie and extra scenes featuring the very best of still and video imagery of Space Shuttle launches, rendered in the highest definition possible. The images and videos are just amazing. Unscripted and superb commentary is provided by two key members of the Shuttle team. If you have even the slightest interest in the Space Shuttle and space travel, or have kids who have interest, then you’re going to want to grab this awesome app. Art Authority for iPad *: A great virtual art museum for the iPad. Contains tens of thousands of the world’s greatest works of art, presented wonderfully well. It’s easier to get around than any museum and provides an intimate and personal experience with all the amazing art it showcases. A great educational tool. Leonardo da Vinci: Anatomy: A fascinating look at da Vinci’s study of the human body, which was far, far ahead of his time. This is one of those iPad apps that reminds you of the amazing things that can be done on an iPad. It’s just the sort of app that Steve Jobs would’ve loved to show off while sitting in a comfy chair when unveiling the iPad back in 2010. The content includes da Vinci’s anatomy drawings that are considered a great treasure in the Royal Collection of Queen Elizabeth II. The app has a superb interactive book style interface that lets you really appreciate the stunning work it features. The Sonnets by William Shakespeare: Speaking of great works and showcasing them in great iPad apps, here’s another fine example. This app brings all 154 of Shakespeare’s sonnets to life on the iPad, and offers a warm, friendly introduction to them; or a deeper dive into them for those who already know them well. It features scholarly comment and insight and performances of the sonnets from a range of great actors. Brian Cox’s Wonders of the Universe: An epic 3D tour of the universe – with Professor Brian Cox, host of the BBC program of the same name, as the guide. This app features amazing imagery and excellent content that covers topics ranging from the smallest particles to the farthest, distant galaxies. Robots for iPad: A complete guide to the world of robotics, delivered in a fun and interactive style. The app does an excellent job at highlighting how robots are already enhancing our lives and showcasing many state-of-the-art robots. It has great background information on the robots along with image galleries, 360 degree views, and videos. There are also robot face-offs and easy ways to save your favorites, rate robots in various ways, and filter robots by type, size, and more. Khan Academy: Another wonderful concept, executed tremendously well on the iPad. Khan Academy offers over 3,500 educational videos presented brilliantly by its creator, Salman Khan. The app promises to let you ‘learn almost anything for free’ and delivers impressively on that promise. The range of topics is broad and impressive – including everything from K-12 math to fundamentals of computer science, SAT prep and finance and history. The Fantastic Flying Books of Mr. Morris Lessmore*: This was my selection last year for overall Best iPad App of 2011. Here’s what I said about it then: If this app doesn’t soon make it into an iPad TV commercial I’ll be shocked. It is the epitome of what makes the iPad live up to its ‘magical’ billing. A wonderful story about books and the love of reading, full of gorgeous illustrations, animations, and fun interactive bits, rendered perfectly for the iPad. iF Poems: The first great poetry app for the iPad. It contains over 270 poems ranging from Shakespeare, Keats and other classic poets to Auden, Yeats, and some more contemporary poets. It does a great job at making poetry approachable for all ages. Many of the poems are read by some leading actors and you can also record your own readings of the poems and share them with friends or family. Dr. Seuss Storybook Apps from Oceanhouse Media*: Many Dr. Seuss titles are timeless classics and Oceanhouse Media are the officially licensed publisher of them on iOS. These eBook apps feature the brilliant original artwork, fun, interactive elements, impressive, professional voiceovers, and options to have the stories read to you, or for you to do the reading. These are lovingly rendered and incredibly well executed. Koto Go Silence*: A lighthearted, fun, and well told story about a dog who fancies himself a ‘samurai of the night’ and sets out to track down all the things that go bump in the night in his house. It’s got fantastic and fun animations as well. A Charlie Brown Christmas*: This app turns the beloved animated classic into an interactive storybook for the iPad (and iOS). A Charlie Brown Christmas does what many of the very best iPad apps do – manages to not feel like an app at all. When you’re using it it’s all Charlie Brown and all about the story. If you’re a Charlie Brown fan, or you’ve got kids in the house who will become fans, then this is a must-have app for the holiday season. Moving Christmas: An instant favorite new Christmas themed storybook for the iPad. It’s got a fresh, original style and it had my daughter and I laughing from its very first sentence. The illustrations are big,bold, and full of humor too. It’s a memorable story with a good message about believing in yourself, and big fun above all. Calorie Counter and Diet Tracker by MyFitnessPal HD: The best calorie counter, exercise tracker and weight loss helper type app for the iPad. It has a massive, unrivaled food database and a very simple, easy to use interface. It also remembers your favorites, scans barcodes, works offline, and has a host of other useful features. Analytics Tiles App: Website stats have never looked so beautiful. This app’s unique and clever tiles-based UI makes it a genuine pleasure to keep tabs on your site stats. Each tile on its grid represents a single Google Analytics report. With just a few quick, simple swipe gestures and taps you can scroll the tiles, switch between sites, change the color scheme for each of your sites, and add, remove and change the position of tiles. A brilliant and handy app. I’m very happy that there are a good number of free apps here and a good range of prices – proof that there are excellent iPad apps to be had no matter what your budget is. 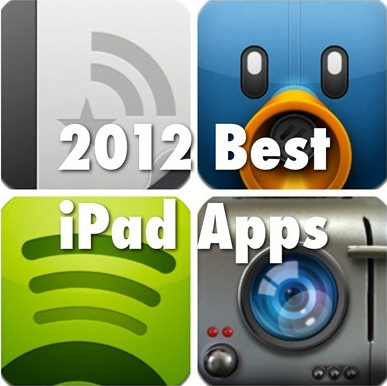 I hope this list will give you lots of great ideas for apps you’ll want to add to your iPad. Please share your thoughts in the comments on which choices you agree with, great apps I missed listing, and any that you’ve installed after reading the list and what you think of them. I fully agree on nomination for Keynote under the productivity category. My presentations have been made so much easier as using an ipad has not only made it less strenuous to carry or keep track of during a presentation, it also gives me a more professional image to my clients/audience during presentations. Many times, this app has delivered the goods. Good list you have there! its a shame to see that Writepdf is not on here, its’ just as good as goodreader is, which i can vouch for having tried both! Quite the list you got here, Patrick! I love how you included links to reviews for some of the ones in here. Even though I’m reading this in 2013, I will definitely take a look and consider purchasing/downloading some of the applications you’ve mentioned in here! Glad to see this kind of quality publishing on here, keep up the good work!